We all have pretty energetic kiddos, and you probably do too! If you’ve ever tried to get them to just be still you know it’s like herding cats, it’s not easy. When Nicole was practicing yoga in her living room she noticed her boy Dash was mesmerized and wanted to “play” too. After taking him through a few poses and stretches it seemed to be that he had stayed focused and attentive for the longest span in his three years of life. We rounded up the rest of the crew to test this new hypothesis, if you turn on some calming music and start doing yoga, the children will come. The older the kids the better in this situation, but even the young kids loved it! Because the instructions can be somewhat confusing for toddlers, Nicole created a way to guide them through the poses: a giant sun! We let them color their own suns on paper plates and then used the plates as a way to direct them. Here’s the all too darling instructions Yogini Nicole gave our Tiny Yogis for a standard sun salutation. Just try not to laugh when they’re very seriously barking at the sun! Put your legs out and in front of you and rub imaginary sunscreen on your feet, your legs, your tummy, your chest, your arms, and all the way up to your head. Now you’re ready to play in the sun! Show me your suns everyone! Where does the sun live? Way up high in the sky, stand up and reach the sun to the sky, stretch it as high as it can go. Spread the sunshine all the way down to the earth. Set the sun down infront of you. Kneel down like a dog (downward facing dog), then bark at the sun. what a fun idea! and love that zuzu monster. This is adorable!! My kiddos practice yoga a preschool and love when we do it together at home. I’ll use this next time! Thanks for sharing! Fabulous, creative idea. You are so smart, Nicole!!! This is so cute. I’ll have to try it with my kids. Great idea! This is the cutest idea! 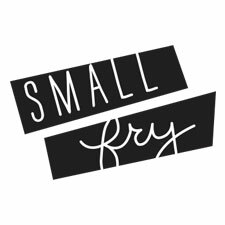 Small Fry makes me more and more baby hungry each passing day. Keep it up ladies.